The company Prefa Praha is one of the largest manufacturers of concrete beams in the Czech Republic. We have already supplied many cranes to Prefa Praha. It is a very heavy crane operation, manipulation with finished concrete beams. In particular interest is a special crane 10t + 10t with rotating crab. 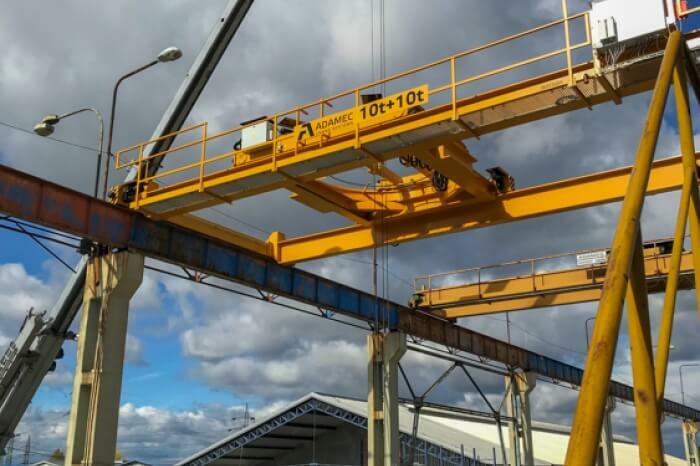 This crane is used in the manufacture of prefabricated building components from reinforced concrete. Prefa Praha produces concrete beams, mostly longer lengths (poles, girders, trusses, ceiling boards, etc.). The manufactured parts are exported from the production hall in the direction of the crane runway to the outdoor storage. For expedition, the components must be rotated by 90 ° for truck loading. This crane is designed for this manipulation. The crane is equipped with high quality Stahl hoists, type SH 5025-20 4/1 L3 ST. In very difficult conditions with high utilization, the ACS client is very satisfied with the crane.